Illegal loggers usually cut the Bigleaf maple logs up in the forest and leave with only the figured (patterned) blocks, and the rest of the log is left behind to rot. University of Adelaide forest DNA forensics research has helped convict National Forest timber thieves in a landmark case in the United States. Four defendants prosecuted for stealing Bigleaf maple wood from the Gifford Pinchot National Forest have pleaded guilty, in a case that marks the first time the US government has prosecuted for illegal interstate trade of wood products under the Lacey Act. The Lacey Act is a US wildlife protection law that was amended in 2008 to include plants, making it illegal to trade in illegally sourced wood products. DNA evidence developed by a consortium of experts led by the University of Adelaide was an important element of the government's case against the timber thieves. Researchers from the University's Environment Institute developed DNA markers for the Bigleaf maple population. They joined the US Forest Service and timber-tracking specialists Double Helix Tracking Technologies, with help from World Resources Institute, to develop the first DNA profiling reference database for the species. It's the only one of its kind for trees that has been validated for use in court proceedings. Just like individual humans, each tree has a unique genetic fingerprint, making it possible to match pieces of sawn wood with the stumps of the trees from which they were cut, using a technique called DNA profiling. "With this technology, wood buyers can verify whether or not Bigleaf maple has been legally harvested," says Professor Andrew Lowe, Chair of Conservation Biology at the University of Adelaide, and Chief Scientific Officer of Double Helix. "Our database indicates that, with these markers, the likelihood of two trees having the same DNA profile is as low as one in 428 sextillion; there are thought to be approximately 70 sextillion stars in the universe." Within the United States, the theft of Bigleaf maple from public lands in the Pacific Northwest has been a persistent problem. Distortions in maple wood grain can create patterns prized by woodworkers and used particularly in the musical instrument trade to make unique guitars. When milled, a single log of maple can be worth more than $100,000. University of Adelaide Research Fellow Dr Eleanor Dormontt manages the University's timber tracking activities. "This project has been a fantastic team effort here at Adelaide and we are all really proud that our work has helped secure such a landmark conviction," Dr Dormontt says. "Illegal logging is a significant problem across the world, contributing to the destruction of the world's forests and oppression of many of its most vulnerable people. DNA profiling and tracking of timber provides a means to help curb this illegal activity and support legitimate forest industries." Timber theft and illegal trade affects a large proportion of the world's trade in forest products. 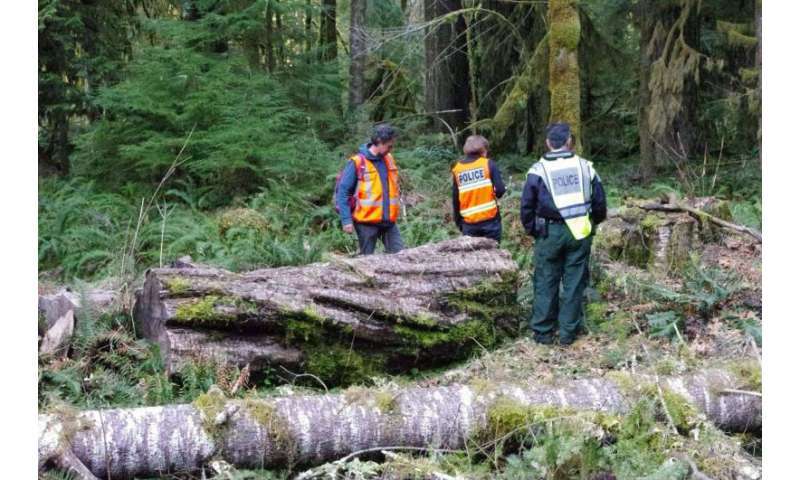 In the case of Bigleaf maple, an inability to definitively match seized timber back to suspected theft sites have made previous prosecutions difficult.